The KlearFlo pH Neutralizer Whole House with Backwashing is an effective chemical-free, all natural way to raise your pH to every faucet in your home without damaging the environment. No more corrosive acidic water. Might be needed in order to effectively filter iron, manganese and other contaminates. Easy to install and maintain with easy pour cap. Acidic water can leach unhealthy levels of copper from pipes and cause greenish-blue stains on fixtures. It can cause many other corrosion problems as well, and drastically shorten the life of all water-using equipment, including dishwashers, washing machines, hot water heaters and fixtures. Ph is an indicator of the acid or alkaline condition of water. The pH scale ranges from 0-14; 7 indicates the theoretical neutral point. In the KlearFlo pH Neutralizer Whole House, acidic waters slowly dissolve the calcium and magnesium media on contact as the water flows through the filter, raising the pH of the water and increasing the alkalinity. This eliminates the effects of corrosive water chemistries and can help to prevent corrosion of piping and fixtures. An automatic backwashing cleans the bed and prevents compaction. Our KlearFlo pH Neutralizer tank has a unique port to add additional media. With our product, there is no need to remove the control valve, making it very easy to add media when needed. Future media can quickly and easily be added to the tank. This is typically needed only once per year for most residential applications. 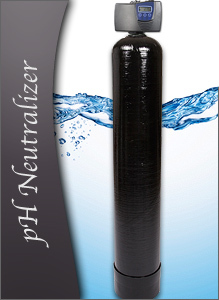 The KlearFlo pH Neutralizer Whole House will raise your pH level by what is needed (pH test is required), and also acts as a filter removing sediment, then backwashes the sediment out. KlearFlo Water Systems warrants to the end user (customer) that it's media tank will be free from defects in material and workmanship under normal use and service for the life of the system. No warranty is made with respect to defects or damaged due to neglect, misuse, alterations, accident, misapplication, physical damage, installation on water quality outside guidelines for system or damaged caused by fire, acts of God, or freezing.